While differentiating between human and machine, one can easily give an example of their languages. Generally, the machine-readable language is not compatible with human learning but XML is a string that joins both. Basically, it is Extensible Markup Language that has a set of rules for encoding. It is a kind of text document file with information that you can easily read and understand. Just like robots .txt file, xml sitemap has also a great significance for search engine optimization. The main aim of every digital marketing expert is to bring more traffic that leads to conversion. For this purpose, search engine optimization is a trusted and stable method. After the successful execution of all SEO strategies, it is also essential to allow search engine for detecting targeted keywords. This XML sitemap file has the potential to improve the search engine ranking of a specific URL. Scroll down the page to know about it in detail. 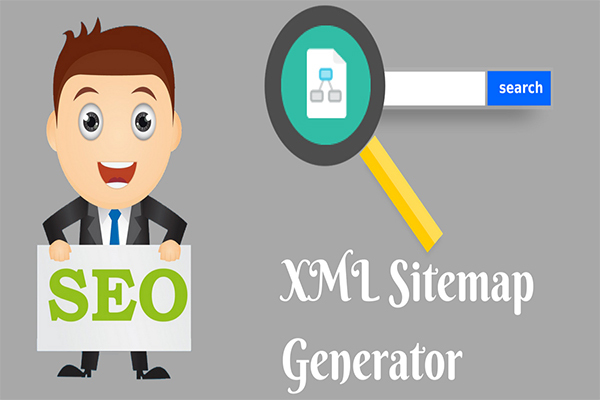 What is XML sitemap generator tool? Before going further with the tools of generating this file, first, you need to understand this format in thoroughly. Every SEO expert knows that there are crawler bots executed by search engines like Google and Bing in order to identify the important internal links & keywords. These crawlers sometimes cannot find any linking inside the content of a web page. Consequently, the ranking of the site is badly affected. The XML file is helpful in guiding the crawler by pointing on a specific link. In the file of an XML sitemap, all important URLs are enlisted for the ease of crawler to identify them. This entire process is executed by the webmaster. The main aim of this file is to inform a search engine crawler in order to crawl over a targeted page of the website. It is opposite to robots .txt file that restricts the crawler to consider a specific portion of a website. Now, let’s come to the XML file generating tool. It is just like any typical online tool that SEO marketers use in their strategy. All of these tools work on a similar mechanism, only the time span of reflecting results and user interface differ. You need to fill appropriate values in the online form including URL & search engine detail. It will automatically generate a file that is executable with a webmaster tool. Why we need an XML sitemap generator tool? For digital marketers, the XML sitemap generator is an essential tool. Most of the websites provide it for free of cost online. Even some of them also offer software applications to install that you can choose according to your operating system. Reaching the top ranking in search engine results is a challenging task because all competitors are adopting online business options. For a perfect SEO of the website, correct indexing of its content by the search engine is essential. The XML sitemap file has a set of instructions that inform search engine regarding a newly updated content in the web page so that it can crawl properly. The advantage of crawling on a targeted piece of content means a better ranking. The XML sitemap file contains information regarding all URLs of web pages that you are trying to highlight. The crawler can easily detect sitemap content and collect essential data that improves ranking. Only a dedicated tool for generating such kinds of files can help in better crawling. Sitemap specifies the structure of the website which can be easily crawled by the search engine and index the web pages. To create an XML sitemap without technical coding skills, you can use this tool to generate a sitemap in an easy way. Why XML sitemap is important for SEO? Whenever you make some changes in your website such as content & URLs, it is important to tell it to google. This is possible with the help of an XML sitemap file. It creates a new sitemap that contains the modified & new URLs of your website. When the file of sitemap is submitted through webmaster, it automatically informs Google bots to crawl. Generally, most of the SEO work comes from newly built websites that are least familiar to the search engine. Therefore, the search engine takes time longer than usual in order to crawl. If you want this process to be done quickly, the XML sitemap can help. It guides the crawler to navigate all URLs, collect data and help in quick ranking. Not only for crawling, but the XML file is also capable of creating reports of a particular website. After submitting the file in webmaster tool. It generates several reports regarding the performance and optimization status of your site. It helps in implementing changes where improvement is required. From these 3 points, it is clear that XML files are necessary for SEO experts if they want expected results in a minimum period of time. Nowadays, the online tools of SEO are available in sets on a single portal. Whether you need XML sitemap generator, keyword generator, Robots txt file generator, plagiarism checker or grammar checker, they provide all services. Some of them are completely free of cost whereas others have premium versions with much better potential. The first column is meant for entering the domain URL. Here you need to enter the web address of a site that requires its sitemap file. Now navigate to the second option that will ask for a modified date. You can decide it from the three options. If the site is old and no new content is updated where no date mention is required, choose the default option “do not include.” if you want to set the current date or any specific day from backdating, select the second or third option. The next column is if date where you have to enter the date for which the sitemap is required. The fourth option is regarding the change of frequency. By default, it is none, however, you can customize it as hourly, daily, weekly, monthly, yearly and always. This frequency decides how frequently you want to crown the google bots on your website to detect a new content. The default priority is the fifth field that you need to fill. By default, it is none. However, it spans from 0.0 to 1.0 including 11 decimal digits. The default priority is set for the pages that you need to crawl in different priorities level. The last field of this sitemap generator is setting the total number of pages that you wish to crawl. It varies from 50 to 5000 depending on an individual’s requirement. Finally, verify yourself as human by entering the image text in a box and initiate the process of sitemap generation. Note: It will take some time if your website as a huge number of pages, So be patience and use the tool. 1) Modified date: In the modified date, you can select anything according to your needs. it may be "do not include"," today's date", "custom date" by selecting any one of the options. 2) Change frequency: If you want to specify search engines to crawl the updated pages, you can specify this option based on daily, weekly or monthly to be crawled periodically by the search engines. 3) Priority: Select the default priority number for all the pages to be crawled accordingly or specify different priority number according to your needs. Where To Submit XML Sitemap File? When the entire process finishes, a file of .xml format is generated that one can easily download because of the small size in kilobits. It is submitted in the root directory of a website which is accessible by the webmaster. Submit your file in Public_html files or in the webmaster. After successful submission, you will find a better crawling experience of bots on web content whether it is an old website or new. Generally, Webmaster tool is used for this purpose because it is easy to use with some automated functions. Once you submitted xml sitemap on the top root directory of Public_html files, also submit sitemap toWebmaster for crawling. According to your requirement specify the number of pages to be created for your website in the options as shown. E.g: If your website as 30 pages just selects the range 1 - 50 in the options as per your requirement. It keeps your targeted web URL to rank on the topmost list of search engine. Nowadays, competition is rapidly increasing because a large number of SEO agencies are opened. For staying one step ahead from a competitor, regular use of these tools is essential. When the website rank on the topmost position, the traffic rate will obviously improve that can be easily turned into conversion if the content is convincing. SEO (Search Engine Optimization) is meant for steady as well as stable results that you cannot expect from any paid promotional activity. Therefore every small & big business emphasize organic promotion in priority. The tool of XML sitemap helps in improving the ranking of a page through SEO that has proven long-lasting results. In a website, some content is essential for crawling whereas some contents must stay hidden from the reach of crawlers. For this purpose, different files and tools for generating them online are available online. If you want to become a master of SEO, the knowledge of everything is necessary.